John Maynard Keynes is arguably the most important and influential economist of the twentieth century, and stands alongside Adam Smith and Karl Marx as one of the most famous economic thinkers of all time. Keynes’s radical reassessment of the accepted principles of economics led to new ways of thinking about how to deal with financial crises and economic depressions, and encouraged governments to increase levels of state investment to create economic growth. This historical biography shows how Keynes was more than an academic theorist and how his policy proposals had a significant impact on the economic and financial architecture of many Western countries from the 1920s onward, and on the post-war international financial system. 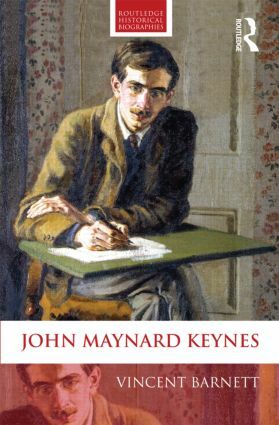 It also tells the story of his colourful private life - Keynes was an active member of the Bloomsbury group of artists and intellectuals, he entertained various ‘secret’ male lovers in his youth, he married a famous Russian ballerina in 1925 and he was also an astute collector of fine art and antiquarian books. Vincent Barnett emphasizes the relationship between the personal and professional by presenting the book chapters in pairs, examining first the central features of Keynes’s life, personal development and policy ideas over the period in question, and then the theoretical content of his major writings from the same period. Barnett argues controversially that allowing psychology a much greater role within economics was a main but often-neglected feature of The General Theory of Employment, Interest and Money, and that Keynes’s policy writings were more concerned with the Britain’s national interest than is sometimes recognised. The result is a concise new biography that is both intellectually rigorous and easily accessible to students and anyone else seeking to understand the life and work of England‘s foremost economist. 'Barnett succeeds brilliantly at making his account entertaining as well as informative. This volume, therefore, would serve as an excellent primer for anyone seeking a readable but scholarly introduction to the ideas and life of the Twentieth Century's most important economist.' — Professor Richard Toye, University of Exeter, in 'Britain and the World', vol.8 no.2, 2015. Introduction. 1. A Most Indescribable and Extraordinary Game 2. Early Writings 3. Selling Economics by the Hour and on the Q.T. (of M.) 4. Early Economics 5. Killing Germans as Cheaply as Possible 6. The Economic Consequences of War 7. Cycling for Britain’s National Interest 8. The Method of Modern Statesman 9. The Fool’s Gold Standard and Laissez Faire 10. The Fluctuating Value of Monetary Reform 11. Organising Prosperity 12. It All Comes Out in the Wash 13. Multiplying (Un)employment by Expectations 14. Liquidising the Classical Theory 15. War Finance and the Post-War Economic Order. Conclusion. Vincent Barnett has been a Research Fellow on numerous economics and economic history projects at various UK Universities. His previous publications include E.E. Slutsky as Economist and Mathematician (2011), Marx (2009), and A History of Russian Economic Thought (2005).